Analog Devices EVAL-CN0411-ARDZ Evaluation Board provides a design reference for the CN0411 Total Dissolved Solids (TDS) Measurement Circuit. The board is intended to work with the EVAL-ADICUP360 Development Board. The device comes in an Arduino shield form factor, making it able to use additional pin compatible developments boards for evaluation and prototyping. 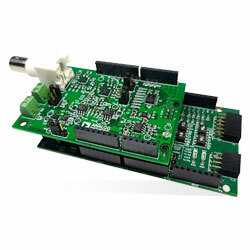 The CN-0411 Demo Software allows the board to configure and read data from the Evaluation Board. This data can be illustrated using a serial port terminal program on a PC. The CN0411 Circuit is a complete single supply, low power, high precision solution for TDS measurements, including temperature compensation. The circuit is optimised for conductivity measurements used to determine the TDS values using a two-wire conductivity cell, connected either to the integrated BMC plug, or one of two terminal blocks provided.